The VHD-800B system consists of two video cameras with identical sensors: Pan-Tilt-Zoom (PTZ) for moving objects and Panorama cameras for a static object. 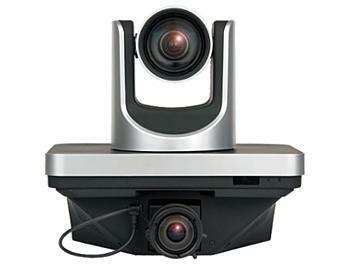 For example, lecturer and audience, classroom - the fixed Panorama camera targets the blackboard and the PTZ camera tracks the lecturer. The camera system can output 5 HD video channels (3 channels for PTZ Camera, 2 channels for Panorama Camera) at the same time. Both teacher and student tracking using the same device. Panorama Camera has C/CS mount changeable lens - easy to use a different lens for a different classroom size. Panorama Camera viewing angle can be adjusted vertically (-25o ~ +15o) for convenient installation. Built-in image recognition and tracking system. Tracking works without any auxiliary camera or tracking host. Both PTZ and Panorama Cameras have the same sensors which allows the image output of the same brightness, color and other settings. PTZ Camera has 72.5 degrees wide-angle lens with 12x optical and 16x digital zoom.